Landslide susceptibility maps are useful tools for natural hazards assessments. The present research concentrates on an application of machine learning algorithms for the treatment and understanding of input/feature space for landslide data to identify sliding zones and to formulate suggestions for susceptibility mapping. The whole problem can be formulated as a supervised classification learning task. Support Vector Machines (SVM), a very attractive approach developing nonlinear and robust models in high dimensional data, is adopted for the analysis. Two real data case studies based on Swiss and Chinese data are considered. The differences of complexity and causalities in patterns of different regions are unveiled. The research shows promising results for some regions, denoted by good performances of classification. This research was partly supported by Sino-Swiss cooperation project EG 42-032010, Swiss National Science Foundation, project “GeoKernels: kernel-based methods for geo- and environmental sciences, Phase II: 200020-121835/1” and National Natural Science Foundation of China (Nos. 40801212). 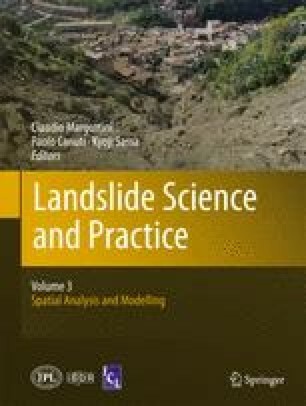 We would like to thank A. Pedrazzini and M. Jaboyedoff for their important contribution in data gathering and the indispensable knowledge in the field of landslides they provided to the current research. We also are grateful to L. Foresti, G. Matasci and M. Volpi for all interesting discussion and valuable help.